Figure 6 in the article shows trajectory of (a) position and (b) orientation of pliers under repetitive laser irradiation without tracking. Grey lines indicate the projections of the trajectory in the respective coordinate planes. Credit: © the authors doi:10.1117/1.OE.56.1.011007. Space debris from completed missions—inactive satellites, lens covers, fragments from spaceship disengagements—pose a serious and ongoing threat to active communication and navigation satellites used by billions of people on Earth. An article published today by SPIE, the international society for optics and photonics, in Optical Engineering describes a new approach whereby debris orbiting in space could be pushed into the Earth's atmosphere by laser impulses, causing it to burn up. Pieces even smaller than a smartphone represent danger to our ability to share information and find our way. While the locations of major space debris are known, fragments smaller than 10 centimeters are difficult to catalogue, and there are 10 times more small pieces than large ones. Because of their remarkably high speeds—up to 15 kilometers per second—small pieces of debris pose a serious threat for space flight and the operation of satellites such as those involved in communications and navigation. In "Laser-based removal of irregularly shaped space debris", Stefan Scharring, Jascha Wilken, and Hans-Albert Eckel of the German Aerospace Center describe a new approach in applying laser-induced damage principles where using high-energy laser pulses modify the orbit of debris and push it into the atmosphere, causing it to burn up. In the weightlessness of space, the authors note, "a secondary effect of laser-induced damage, which is not immediately apparent in experiments on Earth": when part of an object is ablated, or removed, using a laser beam, the recoil transfers momentum to the object. The authors simulate powerful laser oscillations to hazardous materials with the goal of modifying the debris' orbit so that it re-enters and is destroyed by the atmosphere. Similar laser-based concepts to remove space debris have been proposed in the past. However, the other studies have targeted simple geometric shapes such as plates, cubes, spheres, and cylinders that are optimally oriented to the laser source. The authors point out that the drawback of such studies is that they fail to address geometrically complex or irregularly shaped objects—characteristic of most space debris—and do not account for the random orientation of those objects in space. 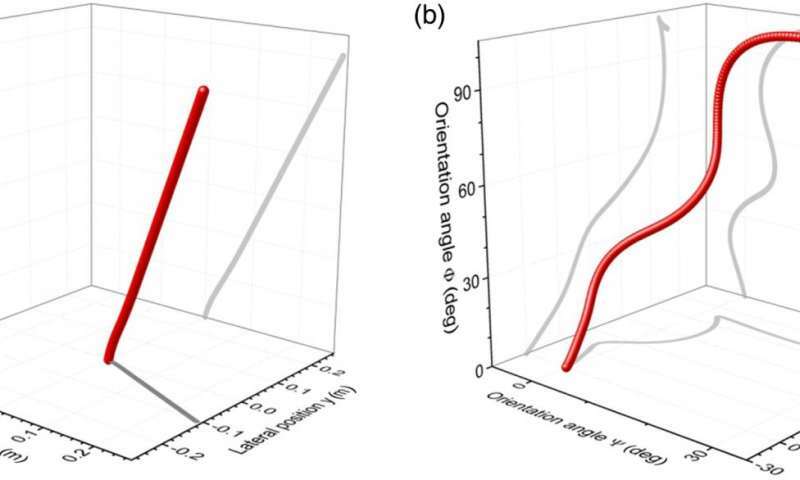 "Our work constitutes the transition from laboratory experiments with idealized flat targets and optimum laser alignment towards simulations of the real world scenario with arbitrarily shaped debris and limited laser pointing accuracy," said the authors. The article is published with open access as part of a special section on Laser Damage under Guest Editors Vitaly Gruzdev (University of Missouri) and Michelle Shinn (Thomas Jefferson National Accelerator Facility). "Laser damage is usually considered to be a negative phenomenon, but this paper considers a significant positive application of laser-induced damage. In this study, the damage produced by laser beams serves a highly useful and positive purpose by cleaning up the space around Earth," said Gruzdev.